Garrod hypothesized that "inborn errors of metabolism" such as alkaptonuria occur because _____. A particular triplet of bases in the template strand of DNA is 5' AGT 3'. The corresponding codon for the mRNA transcribed is _____. The genetic code is essentially the same for all organisms. From this, one can logically assume which of the following? A) A gene from an organism can theoretically be expressed by any other organism. B) DNA was the first genetic material. C) The same codons in different organisms translate into different amino acids. D) Different organisms have different types of amino acids. The figure above shows a simple metabolic pathway. According to Beadle and Tatum's hypothesis, how many genes are necessary for this pathway? D) It cannot be determined from the pathway. Refer to the metabolic pathway illustrated above. If A, B, and C are all required for growth, a strain that is mutant for the gene-encoding enzyme A would be able to grow on medium supplemented with _____. Refer to the metabolic pathway illustrated above. If A, B, and C are all required for growth, a strain mutant for the gene-encoding enzyme B would be able to grow on medium supplemented with _____. A possible sequence of nucleotides in the template strand of DNA that would code for the polypeptide sequence phe-leu-ile-val would be _____. What amino acid sequence will be generated, based on the following mRNA codon sequence? Refer to the figure above. What would the anticodon be for a tRNA that transports phenylalanine to a ribosome? Which of the following contradicts the one-gene, one-enzyme hypothesis? A) A mutation in a single gene can result in a defective protein. B) Alkaptonuria results when individuals lack a single enzyme involved in the catalysis of homogentisic acid. C) Sickle-cell anemia results in defective hemoglobin. D) A single antibody gene can code for different related proteins, depending on the splicing that takes place post-transcriptionally. Which of the following is directly related to a single amino acid? In the process of transcription, _____. Codons are part of the molecular structure of _____. What does it mean when we say the genetic code is redundant? A) A single codon can specify the addition of more than one amino acid. B) The genetic code is different for different domains of organisms. C) The genetic code is universal (the same for all organisms). D) More than one codon can specify the addition of the same amino acid. Once researchers identified DNA as the unit of inheritance, they asked how information was transferred from the DNA in the nucleus to the site of protein synthesis in the cytoplasm. What is the mechanism of information transfer in eukarotes? A) DNA from a single gene is replicated and transferred to the cytoplasm, where it serves as a template for protein synthesis. B) Messenger RNA is transcribed from a single gene and transfers information from the DNA in the nucleus to the cytoplasm, where protein synthesis takes place. C) Proteins transfer information from the nucleus to the ribosome, where protein synthesis takes place. D) Transfer RNA takes information from DNA directly to a ribosome, where protein synthesis takes place. According to the central dogma, what molecule should go in the blank? Codons are three-base sequences that specify the addition of a single amino acid. How do eukaryotic codons and prokaryotic codons compare? A) Prokaryotic codons usually contain different bases than those of eukaryotes. B) Prokaryotic codons usually specify different amino acids than those of eukaryotes. C) The translation of codons is mediated by tRNAs in eukaryotes, but translation requires no intermediate molecules such as tRNAs in prokaryotes. D) Codons are a nearly universal language among all organisms. Which of the following occurs in prokaryotes but not in eukaryotes? Which of the following statements best describes the termination of transcription in prokaryotes? A) RNA polymerase transcribes through the polyadenylation signal, causing proteins to associate with the transcript and cut it free from the polymerase. B) RNA polymerase transcribes through the terminator sequence, causing the polymerase to separate from the DNA and release the transcript. C) Once transcription has initiated, RNA polymerase transcribes until it reaches the end of the chromosome. D) RNA polymerase transcribes through a stop codon, causing the polymerase to stop advancing through the gene and release the mRNA. In eukaryotes there are several different types of RNA polymerase. Which type is involved in transcription of mRNA for a globin protein? Which of the following best describes the significance of the TATA box in eukaryotic promoters? A) It is the recognition site for a specific transcription factor. B) It sets the reading frame of the mRNA. C) It is the recognition site for ribosomal binding. D) Its significance has not yet been determined. Which of the following does not occur in prokaryotic gene expression, but does occur in eukaryotic gene expression? A) mRNA, tRNA, and rRNA are transcribed. B) RNA polymerase binds to the promoter. C) A cap is added to the end of the mRNA. D) RNA polymerase requires a primer to elongate the molecule. 26) In the structural organization of many eukaryotic genes, individual exons may be related to which of the following? 27) In an experimental situation, a student researcher inserts an mRNA molecule into a eukaryotic cell after she has removed its cap and poly-A tail. Which of the following would you expect her to find? A) The mRNA is quickly converted into a ribosomal subunit. B) The cell adds a new poly-A tail to the mRNA. C) The mRNA attaches to a ribosome and is translated, but more slowly. D) The molecule is digested by enzymes because it is not protected at the end. 28) Which components of the previous molecule will also be found in mRNA in the cytosol? 29) Which one of the following statements about RNA processing is true? A) Exons are cut out before mRNA leaves the nucleus. B) Ribozymes may function in RNA splicing. C) RNA splicing can be catalyzed by tRNA. D) A primary transcript is often much shorter than the final RNA molecule that leaves the nucleus. 30) A primary transcript in the nucleus of a eukaryotic cell is _____ the functional mRNA, while a primary transcript in a prokaryotic cell is _____ the functional mRNA. 31) A particular triplet of bases in the coding sequence of DNA is AAA. The anticodon on the tRNA that binds the mRNA codon is _____. 32) Accuracy in the translation of mRNA into the primary structure of a polypeptide depends on specificity in the _____. 33) A mutant bacterial cell has a defective aminoacyl-tRNA synthetase that attaches a lysine to tRNAs with the anticodon AAA instead of the normal phenylalanine. The consequence of this for the cell will be that _____. 34) There are sixty-one mRNA codons that specify an amino acid, but only forty-five tRNAs. This is best explained by the fact that _____. 35) Which of the following is the first event to take place in translation in eukaryotes? 36) A signal peptide _____. 37) The release factor (RF) _____. 38) The dipeptide that will form will be _____. 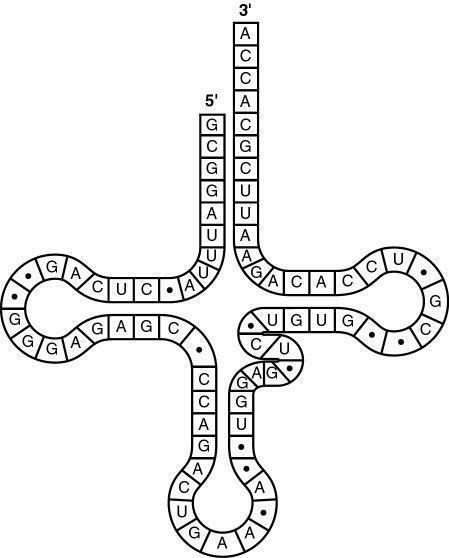 40) What type of bonding is responsible for maintaining the shape of the tRNA molecule shown in the figure above? 41) The figure above represents tRNA that recognizes and binds a particular amino acid (in this instance, phenylalanine). Which codon on the mRNA strand codes for this amino acid? 42) The tRNA shown in the figure above has its end projecting beyond its end. What will occur at this end? A) The amino acid binds covalently. B) The excess nucleotides (ACCA) will be cleaved off at the ribosome. C) The small and large subunits of the ribosome will attach to it. D) The cap of the mRNA will become covalently bound. 43) What must occur before a newly made polypeptide is secreted from a cell? A) It must be translated by a ribosome that remains free within the cytosol. B) Its signal sequence must target it to the ER, after which it goes to the Golgi. C) Its signal sequence must be cleaved off before the polypeptide can enter the ER. D) Its signal sequence must target it to the plasma membrane, where it causes exocytosis. 45) During elongation, which site in the ribosome represents the location where a codon is being read? 46) Once a peptide has been formed between the amino acid attached to the tRNA in the P site and the amino acid associated with the tRNA in the A site, what occurs next? D) The codon-anticodon hydrogen bonds holding the tRNA in the A site are broken. 47) Which one of the following, if missing, would usually prevent translation from starting? 48) Put the following events of elongation in prokaryotic translation in chronological order. 49) How does termination of translation take place? A) The end of the mRNA molecule is reached. B) A stop codon is reached. C) The cap is reached. D) The poly-A tail is reached. 50) Post-translational modifications of proteins may include the _____. 51) Which of the following statements is true about protein synthesis in prokaryotes? A) Extensive RNA processing is required before prokaryotic transcripts can be translated. B) Translation can begin while transcription is still in progress. C) Prokaryotic cells have complicated mechanisms for targeting proteins to the appropriate cellular organelles. D) Unlike eukaryotes, prokaryotes require no initiation or elongation factors. 52) Which of the following types of mutation, resulting in an error in the mRNA just after the AUG start of translation, is likely to have the most serious effect on the polypeptide product? 53) A nonsense mutation in a gene _____. 54) Which of the following DNA mutations is most likely to damage the protein it specifies? 55) The most commonly occurring mutation in people with cystic fibrosis is a deletion of a single codon. This results in _____. 56) Of the following, which is the most current description of a gene? 57) How might a single base substitution in the sequence of a gene affect the amino acid sequence of a protein encoded by the gene, and why? A) Only a single amino acid could change, because the reading frame is unaffected. B) The amino acid sequence would be substantially altered, because the reading frame would change with a single base substitution. C) All amino acids following the substitution would be affected, because the reading frame would be shifted. D) It is not possible for a single base substitution to affect protein structure, because each codon is three bases long. 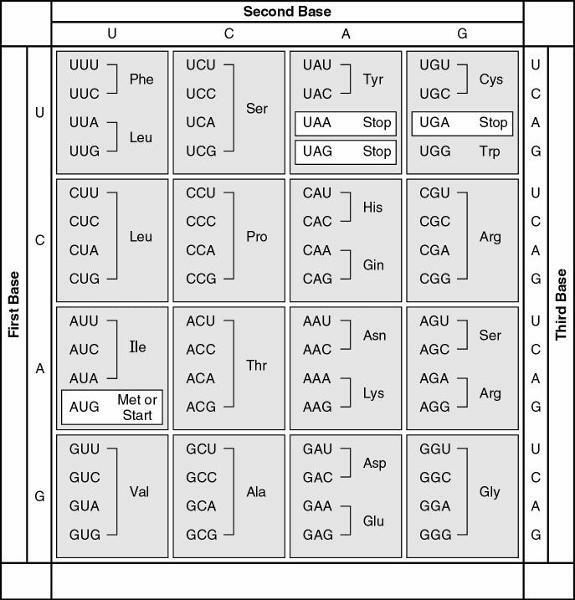 58) An original section of DNA has the base sequence AGCGTTACCGT. A mutation in this DNA strand results in the base sequence AGGCGTTACCGT. This change represents _____. 59) A single base substitution mutation is least likely to be deleterious when the base change results in _____. 60) Rank the following one-base point mutations (from most likely to least likely) with respect to their likelihood of affecting the structure of the corresponding polypeptide.